Is there a sequel to Rekindled Flames? 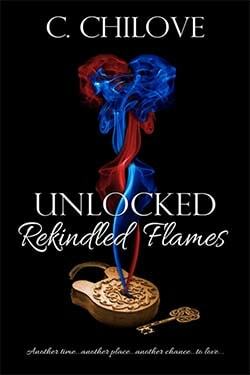 Answer: Yes, there is a sequel to Rekindled Flames. For more information on sequel click here. Are there more past lives? Answer: Eunice Carrington is a Task Companion. Task Companions are guides who help ensure those they are charged with protecting achieve lifetime goals. Alonna’s mom and Donovan’s aunt seem to be special? Answer: The next book in the series explains more about Eunice and Gwen being “special” as Task Companions. Answer: This has been a burning question for many, and I do apologize. From an editorial viewpoint this simply worked best for what is planned in the story. I assure you by Chapter 2, in the upcoming release, you will have your answer. Who sent Alonna the flowers? Why does Donovan’s mom hate Alonna so much? Answer: Vivienne Derbinay is a complex character with many layers. More of which is uncovered in the upcoming release. But let me give some context from what you’ve read so far. Vivienne is Old Guard, Elite, and just plain out snooty. Alonna doesn’t come from the “background” she would prefer for Donovan. Additionally, Alonna is the type of woman who won’t cater to Donovan, and Vivienne sees that. She sees Alonna could be the one to break this strong, masculine son she’s devoted her life too. Do you consider the story paranormal? 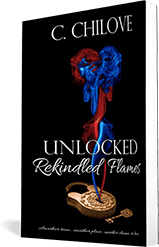 Answer: Unlocked: Rekindled Flames, uniquely explores the soul mate phenomenon and tells the story of reincarnated lovers. To some this may be paranormal. For others who believe in the premise of reincarnation (a somewhat taboo topic in the west)– this is simply the story of an intricately woven pattern of lives withstanding the tests of time to make love right because the souls have finally agreed. How can Donovan flirt with Morgan if Alonna is his flame? Answer: Many comments have come in regarding Donovan’s attraction to Morgan…or how he responded to her during the wedding. Simply, there is something called the law of physical attraction. I think to not have him attracted to Morgan would have been unrealistic. Men…and women can be in love (head over heels) with one person and yet find another attractive. Flirting is a natural reaction. Ultimately, Donovan never looked at Morgan as more than a distraction. I love music! It inspires me, makes me dream, and just takes me to that happy place. Certain songs spoke to me… set the atmosphere in my imagination for the journey Alonna and Donovan began in Rekindled Flames. So naturally, some songs were mentioned in the story. I’ve collected my music muses to share. Here are the songs I hear in my head as I write, read, and plot Alonna and Donovan’s love story. “Moments in Love (Piano edit)” – Art of Noise *actual song not on Spotify but this version comes close.